If you work in the construction business, you will likely be required to drive and maneuver large construction trucks and heavy equipment. Although it may be part of the job, it can still be dangerous and has led to life-threatening injuries and death. Some accidents are unpredictable and unavoidable, but if you recognize the dangers so that you can take precautions, you’ll vastly lower your chances of being involved in a construction-related accident while working. Both cement and dump trucks weigh a lot. They are hard to turn in tight spaces and it can oftentimes be difficult to brake. Their multiple blind spots also make them difficult to maneuver as drivers won’t know if other drivers or objects are nearby. Furthermore, accidents involving these large trucks can be far more severe because of the large impact and lack of protection. It is often difficult for experienced drivers to drive these trucks, let alone inexperienced people. On the road, truck drivers need to be aware of their surroundings, well-trained, and of course, sober. It can take a toll on drivers because they need to be even more cautious while driving these trucks rather than driving a regular to mid-sized vehicle. Cement and dump truck drivers need to be confident and proficient in their ability to operate these trucks. Constructing structures requires heavy equipment to move and build. Construction areas are typically blocked off to the public so the professionals can complete their jobs. In fact, trespassing in a construction zone is oftentimes a felony. Trespassers will likely be fined and can be imprisoned for entering a construction area without permission. The reason why construction zones are so heavily regulated is because accidents can easily happen so having additional people there that aren’t trained can be a detriment. While operating heavy equipment, drivers and people around them need to be additionally vigilant because one wrong move can cause property damage, serious bodily injuries, and/or death. Even though this equipment doesn’t move quickly, their strength can easily cause a damaging impact. When you are involved in a construction-related accident, the first thing you need to do is seek medical attention. Your health and well-being should always be your number-one priority. You should also inform the person in charge of the construction area, as he or she will likely have insurance and may be liable to you. One of the most important things you should do is contact an attorney. Attorneys will be able to help you receive compensation for injuries and guide you through the steps of a personal injury lawsuit. 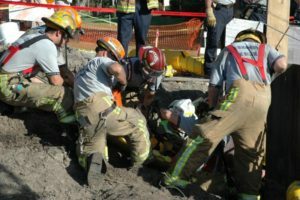 Whether you were on the job or an innocent bystander, these accidents can be devastating and a big shock. Construction-related injuries caused by heavy trucks and machinery have caused a lot of damage and harm but no one should have to deal with that alone. If you are injured in a construction accident, you need a lawyer to help you receive compensation for your injuries. Call us today at The O’Brien Law Firm: (716) 907-7777.